Once upon a time, sequels came if the first movie did well. Now, things are different. Studios make sequels because it is a lazy way to attract viewers; instead of coming up with a new concept, they will just rehash an old one, and people will come to watch it because they kind of know what's going on. This is particularly true with some of the newer horror franchises. The initial movies do not do particularly well, yet sequels still come. When Jeepers Creepers first came out, it did better than expected, but still not well. It started well, creating a wonderful sense of foreboding, but then creator Victor Salva lost his mind and succumbed to horror movie stereotypes. Jeepers Creepers has one of the lamer concepts (not to mention a stupid name) in horror; the Creeper (Jonathan Breck, Good Advice, Jeepers Creepers), a seemingly indestructible monster, emerges once every twenty-three years, and feeds for twenty-three days. It's a pretty limited time span to work with, so the sequel takes place days after the first film, before the Creeper's time is up. This mean's he is still hungry, and this time his target is a busload of high school students coming back from a victorious football game. He taunts them, blowing their tires to strand them, and then picks them off one by one. The only person out to stop him is Jack Taggart (Ray Wise, Windfall, Two Can Play That Game), whose son was the victim of the Creeper a day before. The basic plot, again written and directed by Salva (Jeepers Creepers, Rite of Passage) is that the kids are stupid, and dissension rips them apart, resulting in even higher chances of them being eaten. The main problem is that they are such an anonymous group. The only person that sticks out is Minxie (Nicki Lynn Aycox, Slap Her She's French, Rave Macbeth). One, she has a weird name. Two, Aycox is hot. And three, she somehow discerns in a dream the habits of the Creeper. It really makes no sense, but hey, that's what Salva wanted. Otherwise, there is the white jock, the black jock, the girlfriend, the nerdy manager, and other expendable people. They scream and yell in the bus while the Creepers attacks, and eventually they scream and yell outside the bus while the Creeper attacks. In other words, there is really no point for this movie. The effects for the Creeper are decent, but as the main baddie, he has no charisma. Like Jason, he does not speak. He just swoops in then swoops out. Heck, he even drove in the first film. His methods of killing are gruesome, but nothing extremely so. They do not break any new ground in terms of gore or effects. It's not even that scary, and there are only one or two moments where the audience may feel the need to jump. The dialogue is not particularly memorable, good or bad, and the running time is much too long. 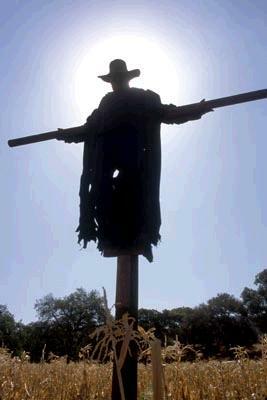 Jeepers Creepers 2 doesn't even do a good job of setting up another sequel, which, unfortunately, will probably happen. Haro Rates It: Pretty Bad. 1 hour, 46 minutes, Rated R for horror violence and language.